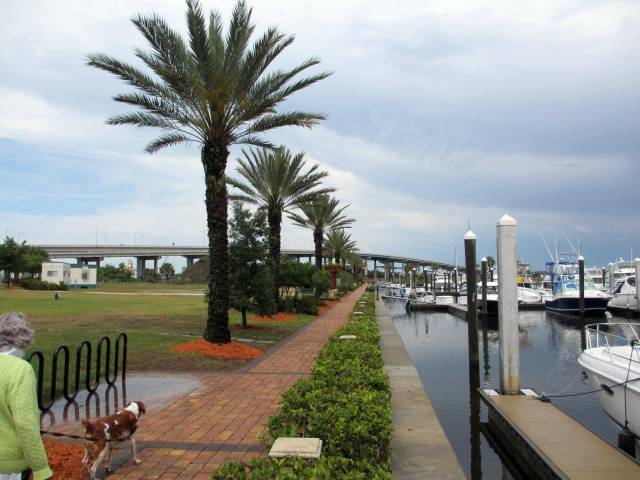 Titusville City Marina - We get scraped! Marathon - More wind, what else is new? We got up this morning and from past experience we looked at the weather forecast before doing anything else. What we saw was a series of storms headed right for us. 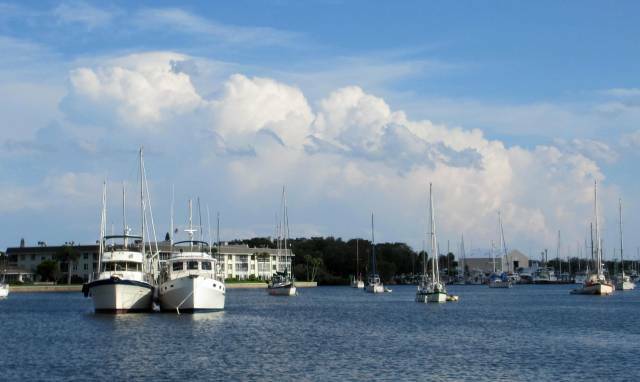 The NOAA forecast for the day predicted thunderstorms all day long with no letup so we decided to stay at Harbortown another day and head for Fernandina on Sunday. We still plan on being at Hinckley's in Savannah on Wednesday. Sure enough, the storms marched in upon us and the last batch produced a severe thunderstorm warning. We counted ourselves fortunate that we chose to stay put, it's not nice being out on the narrow ICW in high winds, low visibility conditions. Besides, the mooring field at Fernandina is not protected very well from winds. The dockmaster, Jim, loaded us a DVD to watch last night, Captain Ron - completely worthless but entertaining, perfect for a night on the dock. We are back in TV land so with just the antenna on the back of the boat that receives whatever is broadcast over the air, we get 50 channels now. Discount half due to either religious or Spanish influences and you still have a pretty good selection, all the major networks are represented. I'll watch NCAA basketball tonight, yeah Ohio State! Harbor is just north of Jacksonville on the ICW. 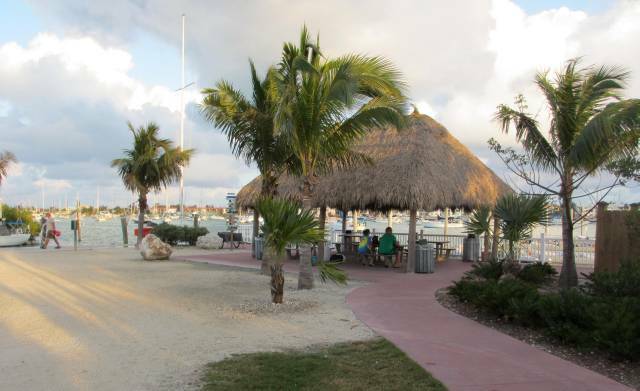 It a private community with condos and docks for the residents. However, they do rent out the docks for a small fee from Jim the dockmaster who then negotiates the fee from the dock owner. We asked for a $1/ft dock and got a dock suitable for a 50 ft boat. 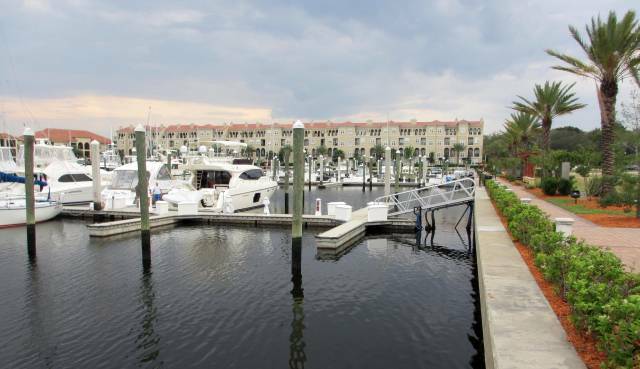 The marina is lower than the surrounding land and surrounded on two sides by four story condos so there is very good protection from winds. The electrical 30 amp line is free but there are no other facilities (no showers, no laundry, no baths, etc.) The docks themselves are floating concrete and very nice. If you call far enough in advance, Jim will usually be around to help you come in. There's a Fresh Market Supermarket about a 10 min walk down the adjacent road along with a small shopping center, it's a nice area. Our trip was uneventful, a few shallow spots but nothing like we're going to see in Georgia and South Carolina. The engine temperature is still hovering around 90 C (194 F) but no higher, at least not yet. We plan on being in Fernandina on Saturday and Sunday and still wind up in Savannah on Wednesday. Thunderstorms are predicted for Saturday which could delay us, we'll see. There are some rules of sailing that sailors are very familiar with but are unknown to the general public. The best know one is that any sailor knows he can control the wind. All he (or she) has to do it chose the direction he wishes to go in and the wind will kick up directly out of that direction (guaranteed!) We used to play this game in Long Island Sound where we would plan our next anchorage out loud and secretly plan to go in the opposite direction (silently, hand signals, lots of pointing, etc.). Sure enough the wind would be out of the direction we first planned (out loud) but when we turned and showed our true intentions, the wind would die for awhile and then reform on the nose again!! I kid you not, it has happened! The second, less know rule is that the phone will ring only when you are in some crisis at the helm. Today is a good example. As we were pulling into the fuel dock at St Augustine, a jet ski was directly in front of the boat - I'm sure that she thought that she had the right of way since that's the way it works on land. 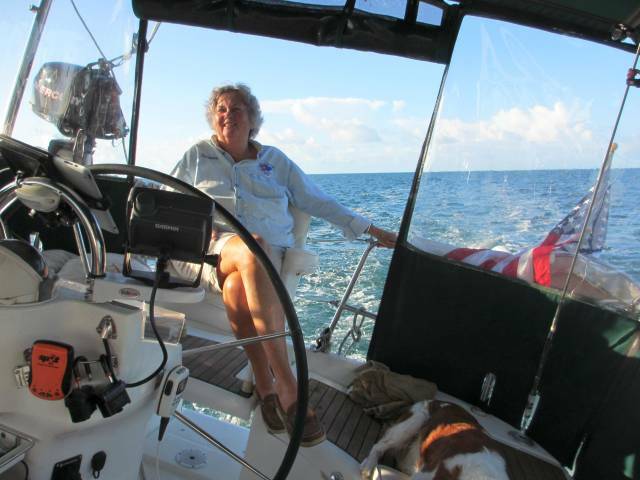 Ann blew the horn at her, after all we can't stop on a dime, especially in two knots of current! At that point the phone rings! Now were having the kitchen redone so we have to answer the phone in case of questions not to mention calls from others. I rip the phone off my belt and toss it to Ann as I handle the lines coming into the dock with Ann at the wheel and backing off with the prop to slow down (one hand for the wheel, one hand for the throttle and the other hand for the phone...) It turns out the call was from our alarm company, the house alarm had gone off - do we want the police called? Well, it turns out that our contractor doing he kitchen had entered the house and entered the wrong code - the alarm went off before he could correct the mistake. 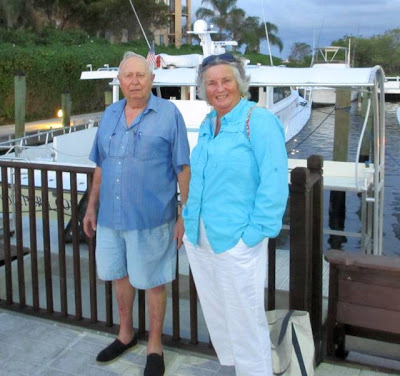 The second call came from the contractor shortly thereafter (with Ann backing down on the throttle so we could secure the boat to the dock). We had motored for 6 hours without a single call and got two just as we were docking - normal happenings for a sailor. We're at St Augustine and it's a beautiful town to walk around in. They have many streets for just pedestrians, no cars and lot and lots of shops to look around in. Some of the houses dated to the 1600's! I would always recommend stopping by when you're on the ICW! 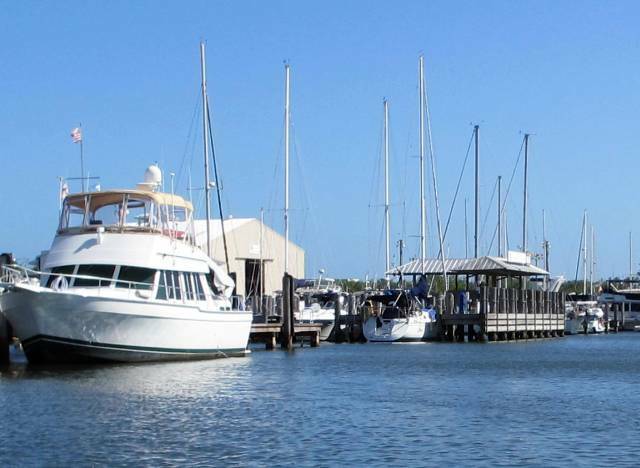 On Friday we're going to a private marina just north of Jacksonville. 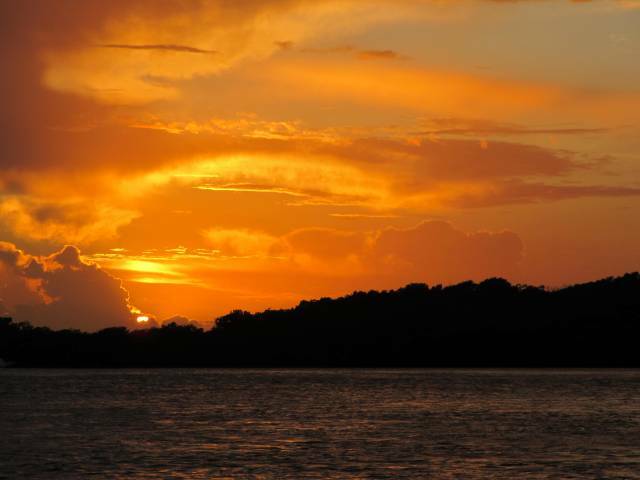 Daytona sunset - what's a blog without a sunset picture? We started out around 8:30 and immediately found that we could now cruise at 7.4 kts under power where the previous day we could only average 6.8 kts at 2300 rpm! At 2500 rpm we got to 8.0 kts! A smooth bottom does wonders for cruising speed. Needless to say, I'm very pleased with the work done by Pier 88 Diving Company. I later learned that it's not just one person but an association of divers that are located all across the country. I'm sold on them now. 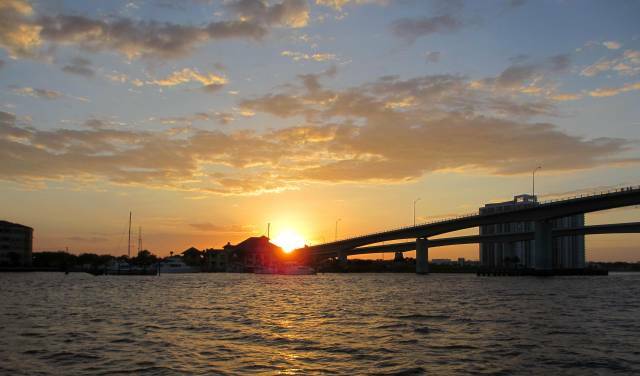 We had intended to overnight at Rockhouse Creek anchorage but we were making such good time and the weather was so good that we continued on to Daytona to anchor just below the twin bridges. It has the prerequisite public boat ramp for access to land for Hoolie relief and it's by the bridge so there's a no wake zone right by the anchorage, nice. Getting rid of the barnacles did vastly improve the boat speed but it did nothing for the high heat problem. Feetwing is still running about 10C (18F) hotter than it should (or did in the past). There is something plugged up or partially clogged and we're still headed for Hinckley at Savannah for a fix. We're now looking at April 4th, a Wednesday for our arrival date at Hinckley. It would be nice to cruise without having to look at the temperature gauge every few minutes. Leaving Cocoa bridge anchorage, we were in a line of boats, all motoring. I saw a 40 ft Hunter slowing coming up from behind. I glanced at my speed on the GPS and saw 6.8 kts. Normally I cruise at 7.3 kts but perhaps there was current against me? My knotmeter wasn't working, fouled. The Hunter passed and that was when I knew I had a fouled bottom. In too years of cruising, I had never been passed while at 2300 rpm by another sailboat. I called ahead to Titusville for a diver to scrape the bottom. It was puzzling since I had already had the bottom cleaned the last week of February in Key West. I called Pier 88 Diving Company and the divers appeared (two!) and proceeded to do the deed. The lead guy said the bottom was covered with barnacles and guided my hand to the aft section so I could feel them for myself - many and rough. No wonder I was slowed down. That brings to mind what the diver in Key West was doing for 1.5 hours under my boat? 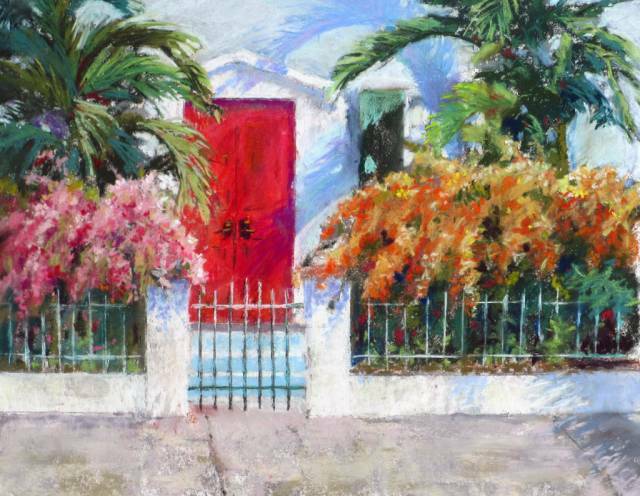 The scraping noise was very apparent today, not so apparent when we were in Key West. 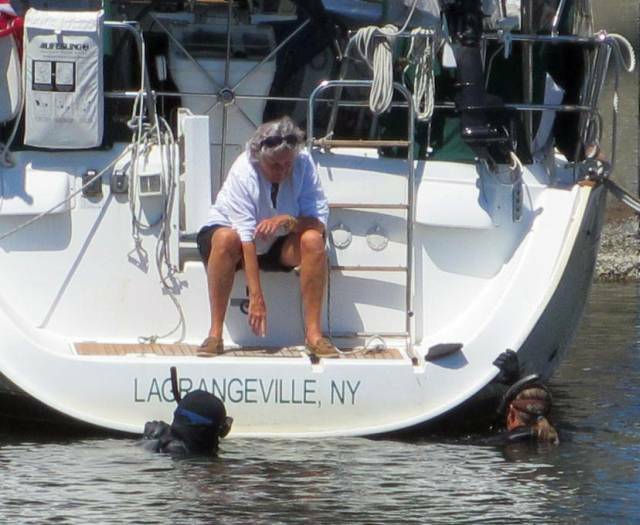 Some of the barnacles were at least 6 month old according to today's divers. The confirmation will come Wednesday when I continue my trip north. If I can now motor at my normal 7.3 kts, then the bottom was never really cleaned in Key West - the diver must have been "resting" under the boat! After all, how can you be sure the bottom is cleaned at the time of the cleaning? Especially when you're leaving the next day. 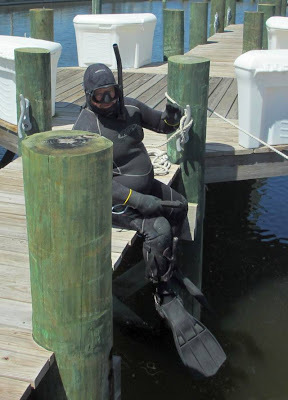 I believe the divers we had today, I heard the scraping sound (not so in Key West), I felt the barnacles before removal. I'll know for sure Wednesday. 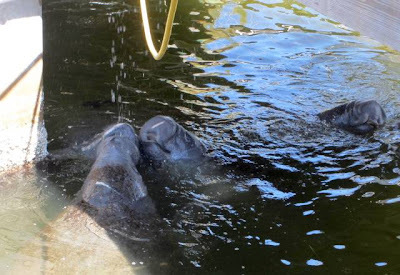 The Manatees thought the divers came to play with them! Titusville has an outstanding dog park, one of the few places along the ICW that Hoolie can run free and play with other dogs - which he did today. He ran and ran until completely exhausted, tongue hanging out, but apparently happy. We'll leave early Wednesday and either anchor at Rockhouse Creek or somewhere in Daytona, depending upon the weather. We had a foul tide all the way north to the Cocoa anchorage just south of the bridge. Normally we do about 7.3 kts but the best we could make today was only 6.2 kts, very slow which made a long day longer. We got started at 8:30 and didn't drop anchor until 4:30. The engine temperature was no better, hovering around 90C (194F), about 10C too high compared to normal. It's not overheating but it is troubling. You're always looking at the gauge. Plus, it's overly sensitive to engine loading, even when charging, it drives the engine to 90C and when the charging cuts off, it drops to 80 to 82C which it never used to do (it was always 80 to 82C in the past regardless of charging or not). At any rate, we'll have the cooling system looked at when we dock at Hinckley in Savannah which now looks like March 4 since we lost a day at Vero. We're at Cocoa, the city on the ICW, not the beach. 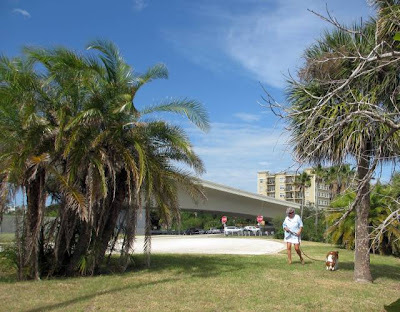 The Cocoa bridge offers protection from the north and a boat ramp convenient for Hoolie relief, always important for us. There must be about a two dozen boats anchored with us, most heading north. 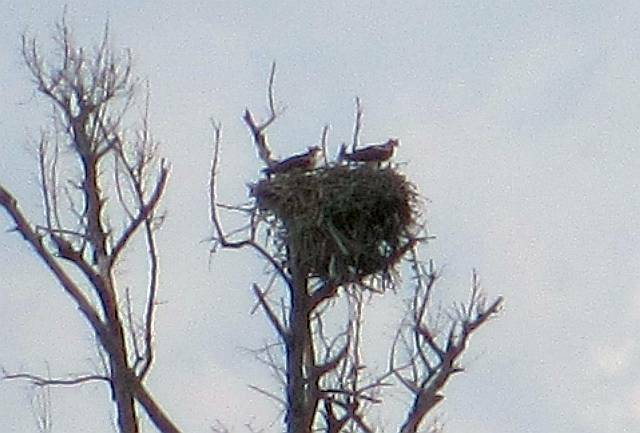 We were early last year on the march north and didn't have much company, now there's many. 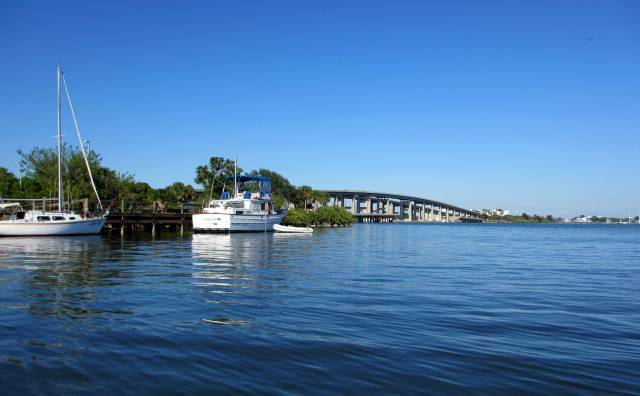 We decided to take an extra day and tuck into Titusville for a day. I want a diver to look at our bottom, we seem to be slower than we should be - perhaps more barnacles? The water was been very warm this year which produces a bumper crop of them. Today was one of the few days we've had with storms. We had rain and even some thunder. Since it was in the forecast (for a change!) 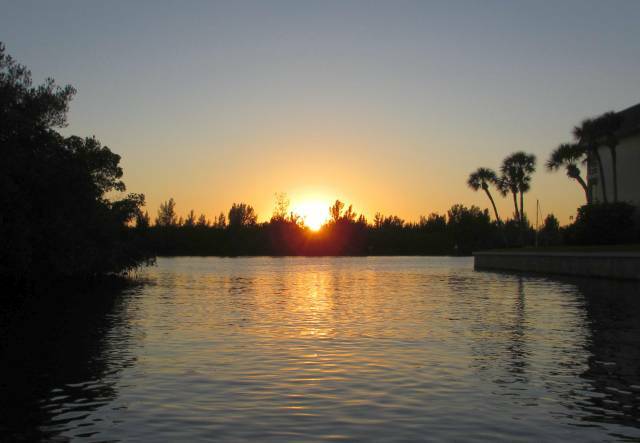 we elected to stay over another day at Vero before heading north on a better day Monday. We dodged storms and rain to take Hoolie on his trips for relief but we made it for the most part. We even made a dash to the fuel dock to take on water, fuel and a pump out. So now the only thing we need is for the weather to cooperate - which it is supposed to do for the next seven days. 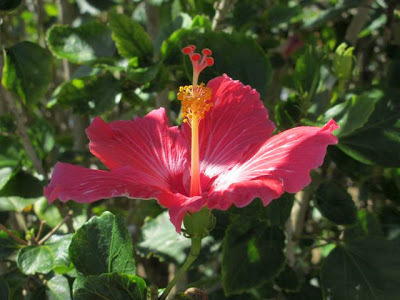 Ann continues to do well with her allergies and we attribute part of that to the use of pollen screens in all the ports. We replaced the standard screens with no-seeums screening in the fall but the pollen screens are even finer in pitch. At one point we opened a port to close a hatch and we could see the pollen in the air that was highlighted by a sunbeam. Once closed with the pollen screen in place, there was no more pollen apparent. It certainly does help. 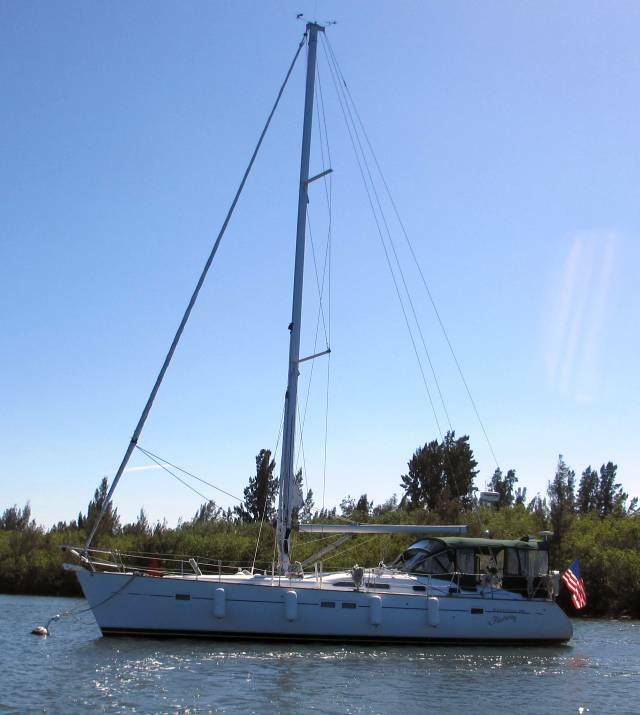 On Monday we plan on an early start for our 47 mile trip to Cocoa Beach anchorage. We've been there before. 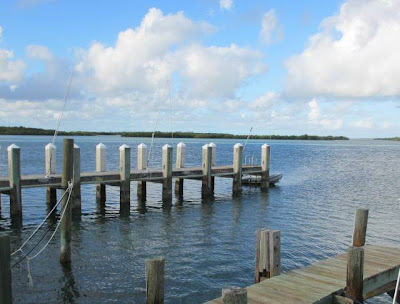 It has a boat ramp for easy access for Hoolie and a large area for anchorage with protection from the north and west. We'll keep track of the engine temperature along the way, wonder what it will do Monday? It was a glorious day with blue skies, 80's, so naturally we did laundry... Reality intrudes even in paradise. That exercise took most of the morning with many trips back and forth to feed the machines their ration of quarters. Along the way we saw dolphins playing the the anchorage. I had plenty of time to reinspect the scene of last year's crime, Ann allergic reactions to live oaks. They are still there but this time we're on a mooring with a good breeze. Once around the docks the breeze is not apparent and that must concentrate the pollen to some extent. So far this time, Ann's had no reaction to the live oak pollen. 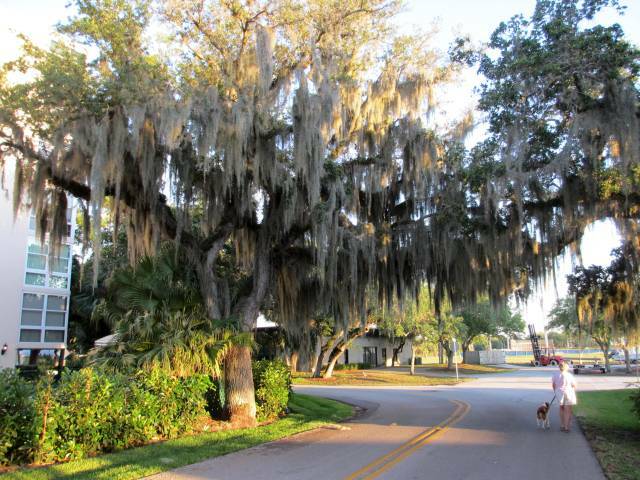 It is hard to believe Florida's fascination with live oaks. It's true that they were instrumental in the construction of America's first true war ships towards the end of the 1700's, six frigates. Key to the strength of the construction technique was the use of live oaks. They have a swirling grain pattern that make them useless for furniture but very strong if the wood is used in the direction of growth. As you can see from the photos, the limbs bend and turn in all directions. You can imagine a builder selecting one piece for the keel, another piece for a rib and so on. 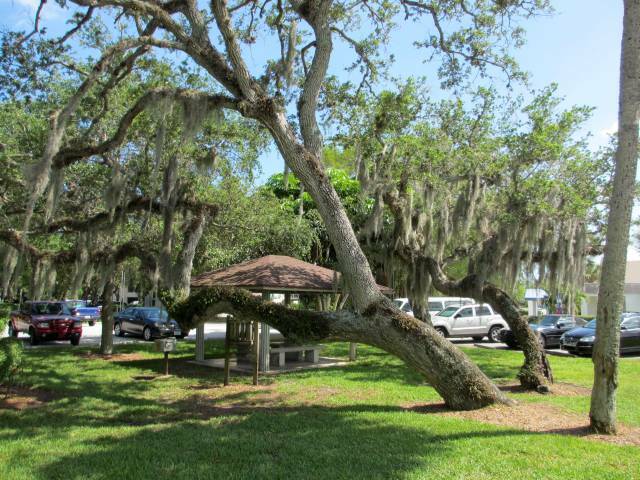 The live oak gave the Americans an advantage over the British in the strength of the ships. Only one of the frigates was defeated by the British. However, Florida has taken the live oaks to heart. If you cut one down (to build a house, remodel, etc. 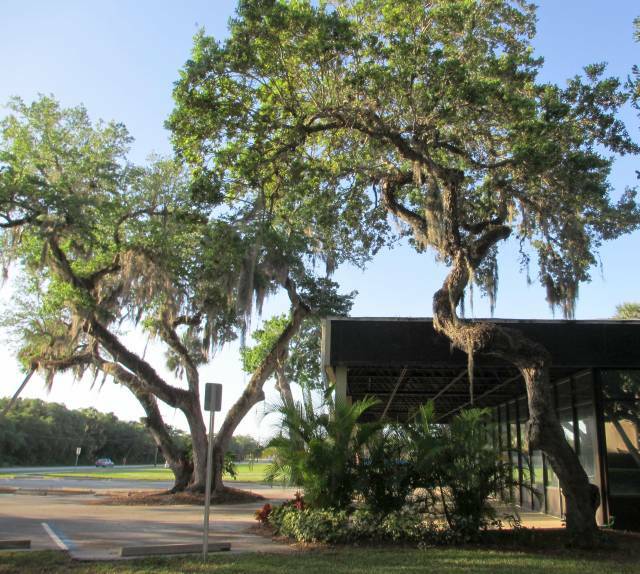 ), then by Florida law, you must replace the tree with two live oaks. 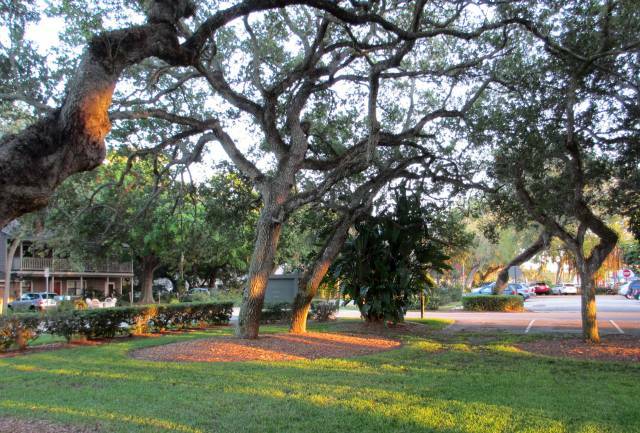 If the live oak is mature beyond a certain size, then it must be replaced with four live oaks! At that rate the sate may soon be overrun with live oaks! 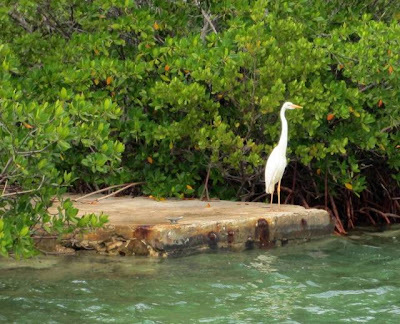 By the way, you also cannot cut any part of a mangrove, not a branch, not a twig, much less a whole tree. With that we now waiting for weather. We may or may not move Sunday. There's a front coming through that may delay our departure. After that is appears to be clear weather (mostly) until we reach Savannah at Hinckley on March 3 or so. You have a choice of two food markets at the first bus stop, Publix and Fresh Market. Both are excellent but with Publix offering a wider selection of products and Fresh Market offering more unique items. Today we chose Fresh Market since we didn't need a lot of groceries. As usual, we took the free bus service to the markets, a 15 minute ride away, shopped and took the free bus back to the marina. Vero is the only place we've seen free bus service. It's available to the entire area, several square miles, very handy. Vero is also the only marina where you're asked to double up with another boat if they become full. We have a mooring by ourselves (so far!) but we have fenders out on our port side as asked in case more boats come in than there are moorings. In all the marinas we've been in, Vero is the only place where they have such a restriction. However, so far, there are still open moorings. 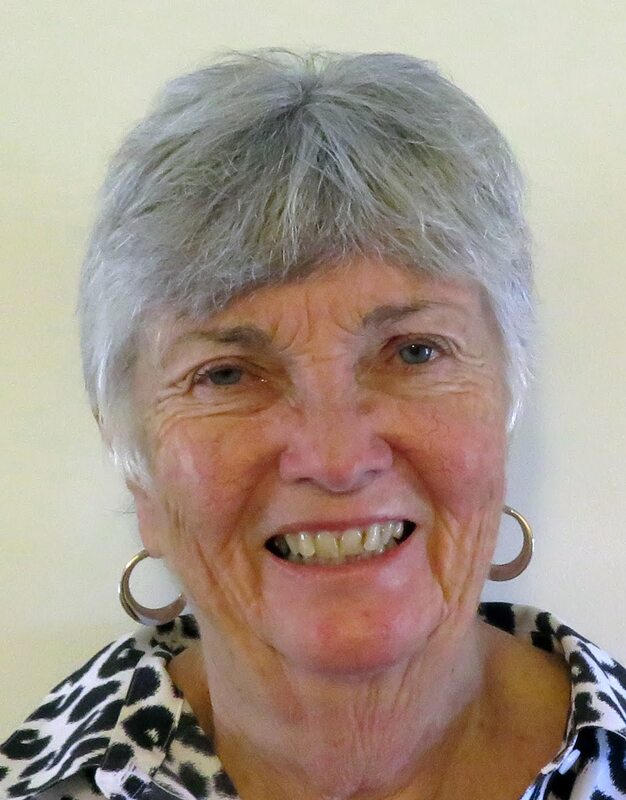 Ann is doing a lot better than last year so far. This is the place where she was taken to the hospital in an ambulance due to an allergy attack from the live oaks that are thick in the marina. We installed new screens that are so fine that they will filter out live oak pollen, the cause of the attack last year. They were special ordered over the internet. So far , so good. 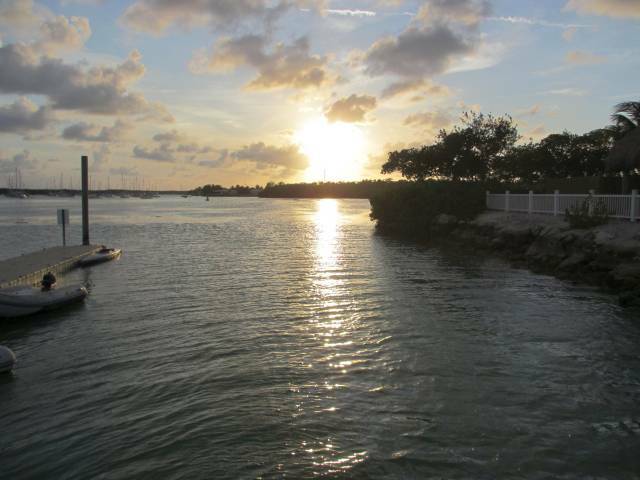 We had never stayed on a mooring at Vero because we didn't care for doubling up. 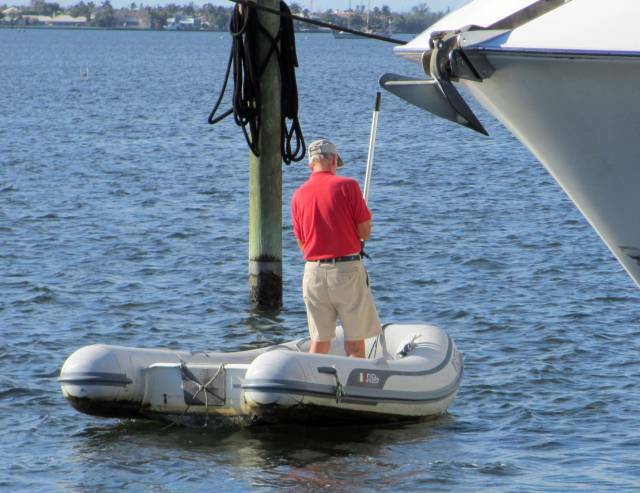 At Vero, if they are full, they will require you to put out fenders and take on another boat. Of course that would not be so bad if you could split the cost of the mooring with the additional boat (dream on!) Two on a mooring or three on a mooring, it's all the same - each one pays the full price for the mooring! Along the way to Vero, I paid strict attention to the engine temperature. Yesterday I had said that the temperature was returned to normal after scraping the bottom of the dinghy of barnacles. Well today the story was different! Once again I'm back to the high temperatures as before, 90C (194F) instead of the normal 80C (176F). I measured the temperatures right at the thermometer location with my IR meter and got the same results. Now for the strange part. After the batteries were fully charged, the charger switched off momentarily and the temperature immediately dropped to 80C, back on it immediately went to 90C. It went through this sequence several times before continuing a constant charge with the engine temp back at 90C. I have no idea what's going on. Each time the IR meter verified the temperature gauge reading. We plan on putting in at Hinckley in Savannah on March 2nd, a Monday to let them sort through this problem. So far, the engine temperature has not gone beyond 90C which is still within the operating limits of the engine. If it does go above 90C, then I'm in more trouble. Outside the engine, we're seeing temperatures in the low 80s F, very warm and the winds we experienced in Marathon have abated. We're out of the trade winds now and we expect more moderate weather heading north. Now it's laundry and some minor provisioning for the next two days. We had planned on getting to Vero Beach City Marina today but it started to rain in the morning and thunderstorms were predicted for the afternoon with continued high winds of 20 to 30 kts. Since we were in no rush, we decided to wait out the less than optimal weather and go on Thursday instead. So we mostly sat on the back of the boat and watched the world go by. By the way, the thunderstorms never materialized (of course!!) We have found that we have the power to control the weather by not going out when it's predicted to be bad - the bad never materializes unless we actually do go out, then it comes on in spades! Amazing but true. So we did a few boat chores (never ending...) and watched the scenery. We saw one guy fishing by walking about half-way out towards our boat (we are anchored in only 7 ft of water). We could almost have invited him aboard. A few other fishing boats came by but we were mostly by ourselves. The high winds came but we never moved an inch, our anchor is well set. The winds have calmed now and we'll have a peaceful night for a good trip north on Thursday. 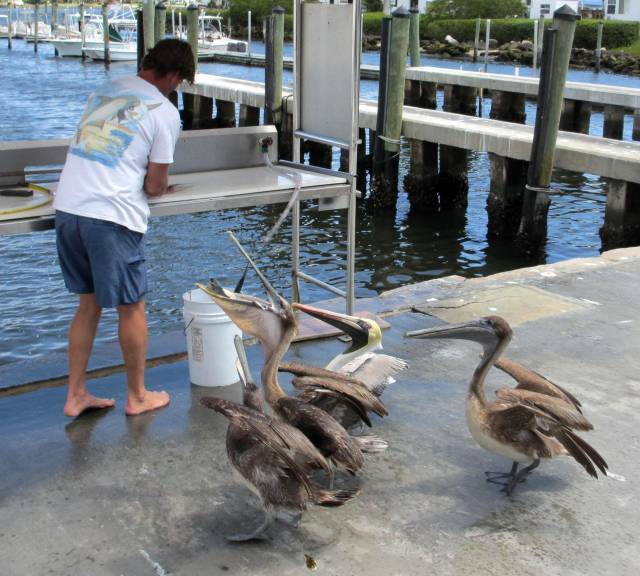 Vero Beach is where they like to raft you to other boats if you're on a mooring. We had never stayed on a mooring there but we thought we'd give it a try this time. I told the marina that we would be running the genset twice a day so whoever is rafted with us ought to be informed of that in advance. They said they thought they could give us a mooring all to ourselves, we'll see. Leaving a dock with a 15 kt wind blowing you broadside towards two pilings demands carefully planning. The first step was to enlist a dockhand from the marina! Otherwise, as soon as the lines were released, the wind was going to blow you into two pilings you'd rather not have a close relationship with. With the dockhand holding the bow close to the dock we were successful in backing out without touching anything, a major accomplishment by itself. We proceeded to the fuel dock and filled up both the diesel and the outboard tanks - all ready for the trip noth now! I must add that it's very important to talk through how you're going to exit a slip, what direction to go in, how to hold the last of the lines for direction control, etc. Confusion at exit is not good! 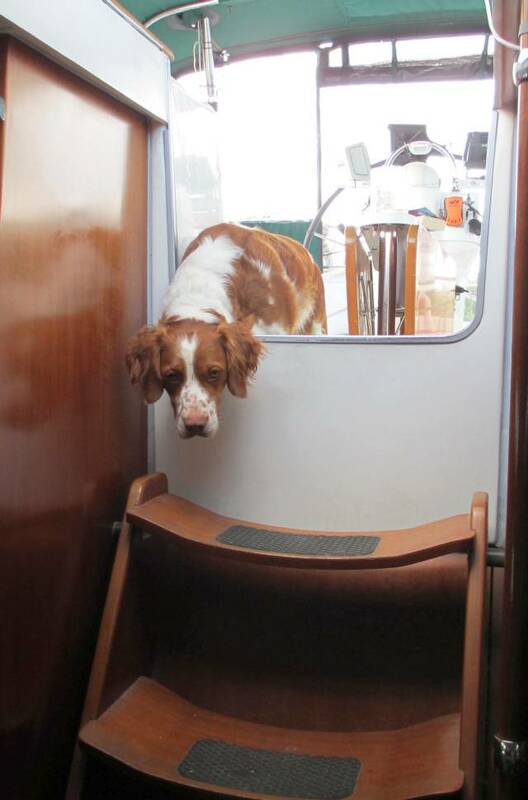 How would you like to meet this guy on a narrow ICW waterway? The Lantana bridge is being rebuilt and will be out of commission for vehicular traffic for almost two years! However, in the meantime, the spans will be left in the open position for boat traffic, a definite plus for those traveling the ICW. The trip north for the next 20 miles is a race against time to make the bridges. There were 6 sailboats headed north and we all made the first bridge but the next bridge required a 7 kt speed to make in time. Normally that can be done but the tide was foul and it slowed us all down. I upped the rpm to 2500 and gradually pulled away from the flotilla. We barely made the bridge opening, still going 2500 rpm without slowing down. The boats behind us had a 1/2 hour wait for the next scheduled opening. By the way, the engine held 80C (normal operating temperature) all the way to 2500 rpm and the only change was cleaning the barnacles off the dinghy I tow behind the boat. Can it be that simple? Spring is early here too? We pulled into our anchorage at 2:45 pm, a nice day for us and relaxed. From here we plan on making Vero Beach City Marina for a couple of days. We'll do a wash and get some minor odds and ends at the supermarket and maybe visit the beach. 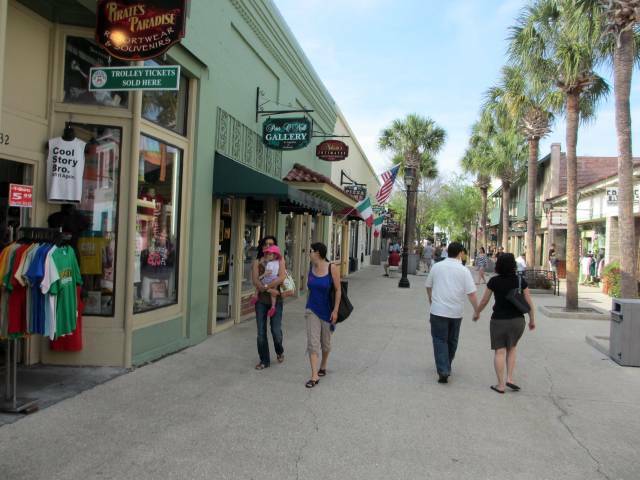 Vero is the city with free bus service and so is very popular with the cruising crowd. 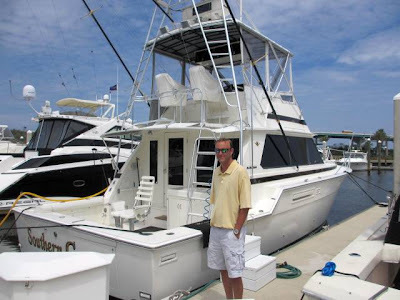 I had the bottom of Fleetwing scraped by a diver in Key West but never thought of the dinghy. I had painted the bottom in June but the same conditions that fouled the bottom of Fleetwing was, of course, operating on the dinghy too. I paddled the dinghy over to the nearest dock and hauled it out. The bottom was amazing, covered by barnacles! I'm sure it was contributing to some of the overheating and a lot to poor fuel mileage. I scraped the bottom and was especially careful with the barnacles attached to the rubber part of the dinghy - I didn't want to cause a leak! It is far from pristine but it's a lot better than it was. It will be interesting on Tuesday just what improvement I see, if any, in the cruising speed and heating problem. Joe Mastri and Ann Sherer - Goodbye Joe! Today was provisioning day and we made the rounds with Joe Mastri, buying a rotisserie chicken for dinner and retiring to Joe's apartment for the rest of the afternoon. 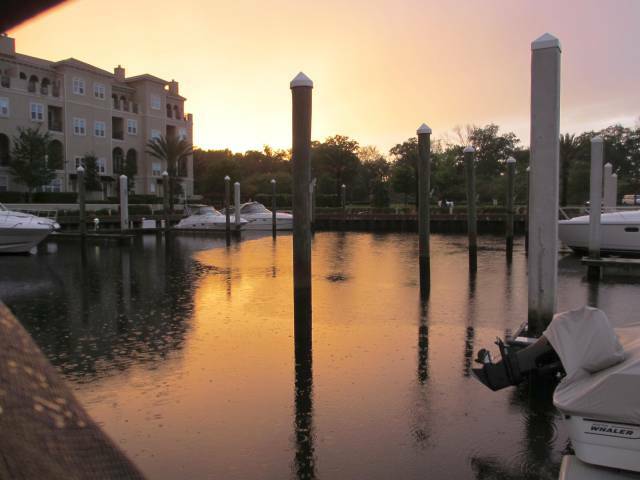 There are 830 apartment units with cooking facilities in Joe's complex and it's right on the ICW. No dogs are allowed but we snuck Hoolie in just the same. Returning to the boat, I filled the water tanks and we'll take on fuel Tuesday morning and we're ready to continue our trip north. 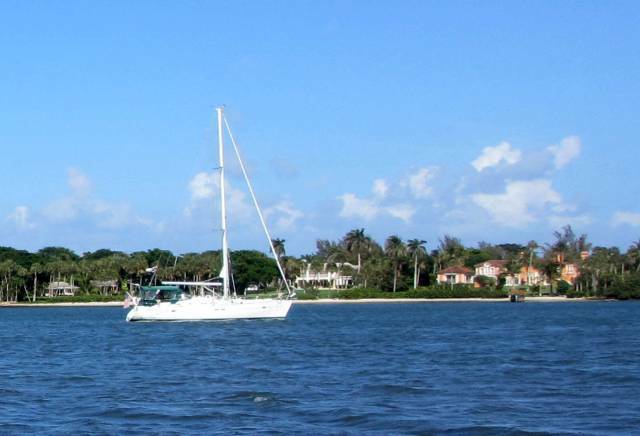 The Hobe Sound anchorage is our next stop before proceeding to Vero Beach City Marina on Wednesday. Impossible to clean fish witout an audience! Today we went through 15 bridges and never had a wait longer than 5 minutes. The opening times are chosen so a boat can make the bridges if it can maintain 7 knots. It's like timed traffic lights, don't go too fast or too slow and you can proceed without having to stop. Of course motorboats have no problem maintaining the 7 kt target but some of the smaller sailboats will miss some of the openings and have to wait the usual 1/2 hour for the next one. Also, if the current is especially perverse, it can also mess up your timing but all was with us today. We also traveled on a no-no day, a weekend through the "canyon", an area where the ICW is narrow and both sides are lined with concrete bulkheads. There's nothing to dampen the waves and any passing boats send out waves that reflect off the "canyon" walls back into the ICW creating very confused water. The action on the boat is similar to what's experienced in going through the east river in NYC when a tug passes except that it lasts for 30 miles! Sunday morning wasn't so bad but in the afternoon, the canyon demonstrated its reputation. The passing powerboats showed no mercy to us slow sailboats, sometimes only a few feet off one side of the boat but we made it through in one piece. We like Palm Beach Yacht Center because it's close to Joe Mastri and it's only $1.50/ft with the BOAT/US discount. Joe met us a 6:00 and we went out to one of Joe's favorite places, The Golden Corral, a buffet type restaurant that was packed. For $11.00 each for all you can eat, it was very reasonable. 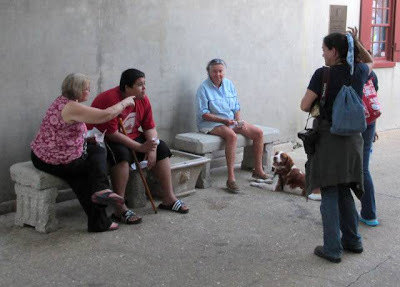 On Monday we'll meet Joe again and get provisions for the next stage of our trip north. We'll start that leg on Tuesday. Meanwhile, we are having our kitchen remodeled by Ron Converse and with every step along the way, we can see the progress through one of the webcams I have installed in the house. Ron will move it around to show us various aspects of his progress, very interesting. Ann loves to watch. Lined up in Miami - calm before the rough exit through the inlet! Since we didn't have far to go we had a leisurely breakfast and hauled anchor about 9:00 am. Along the way the Coast Guard warned that when two cruiseships are transiting the inlet at the same time, the inlet will be closed to all other traffic! Fortunately, we were able to get out before the cruiseships left. What we did not figure on was the outgoing tide, about 2 kts and the incoming waves, about 3 ft. The current transformed the waves into squares! Our bow would plunge into the trough between the waves crests and cut off the top of the following wave which would then wash down the length of the top deck - all accomplished with a resounding pound (boom!!) and a wild action on the helm. It was the roughest stretch of water I've ever been in, much rougher than Hell Gate or the East River. After a while I tried to avoid some of the worse of the waves, you could see down into a "hole" in the water as a trough passed by, about 4 ft down. After what seemed like forever (about 20 min) I was able to turn north and escape the inlet. The water was the usual sea wave action, nothing at all like the inlet! Wow. Next time I'll pay more attention to whether the current is outgoing or not when exiting an inlet. 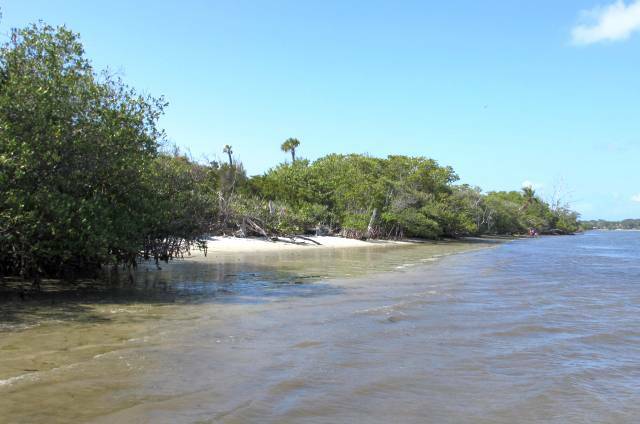 By the time we approached Ft Lauderdale, the tide had changed and the inlet had incoming current, the inlet was relatively smooth except for passing boats which showed no mercy - but that's normal wave action when there's no current, not a problem. 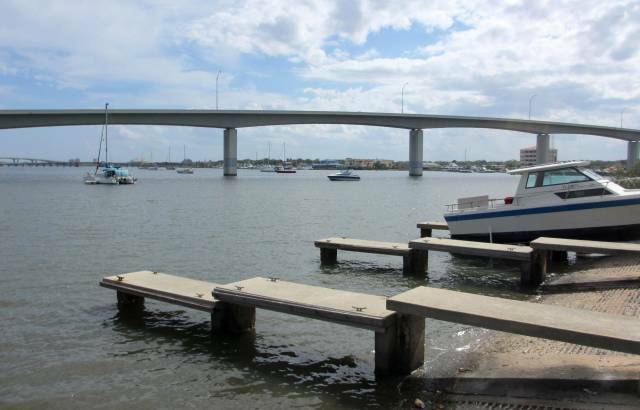 At Ft Lauderdale we like to take a mooring by the bridge to the beach. There are only 7 moorings available and we were afraid that they would all be taken on a Saturday but they were not. In fact, there are still three empty moorings even now at 8:00 pm. It's a three block walk to the beach from the dinghy dock at the marina so we ventured forth to see the spring breakers. What a crowd! The beach was packed, wall to wall kids! It was too crowded to walk Hoolie so we headed back to the boat. The mooring field here is right next to a bridge that opens ever half hour so there's lots of car traffic but it's surprisingly little wake action since all the boat slow down for the bridge. On Sunday we'll head north to Palm Beach Yacht Center for two days and visit with Joe Mastri before heading further north. Miami at Marine Stadium - At anchor, wonderful sail? Relaxed, dog's at ease, good wind, fast sailing - what else do you really need? High tide at Caesar Creek was at at 6:00 am which was before daylight. 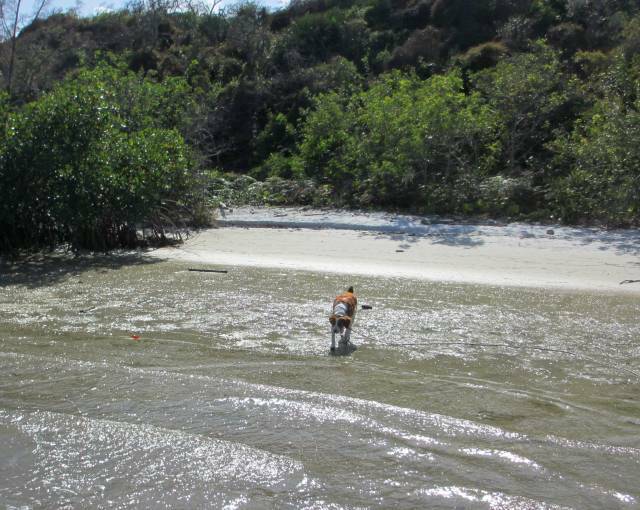 We had to take advantage of high tide to clear the shallows at the exit of the creek. We settled on leaving at 7:15 which still had 1.3 of tide instead of 1.4 at 6:00 am. 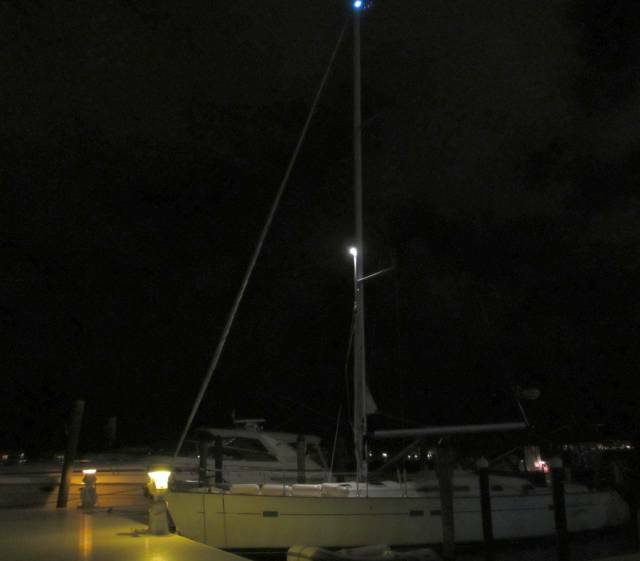 I took Hoolie ashore in the dark but the ranger station dock was lit at night so I had no trouble docking. Returning to the boat, we started to haul anchor but when I stepped on the UP switch at the anchor locker, nothing happened! We couldn't afford any debug time, the tide was dropping! Luckily I had a hand held switch which plugged into a socket by the side of the windlass and it worked, whew! Up came the anchor and off we went. I watched the depth sounder as it dropped down. I need 4 ft, 9 inches and when I saw 5.0 ft appear, I was really concerned, after all, this was with a 1.3 ft tide! Fortunately, it never got lower than 5 ft and the depth gradually, slowly increased as we motored out into Biscayne Bay. Another successful escape. 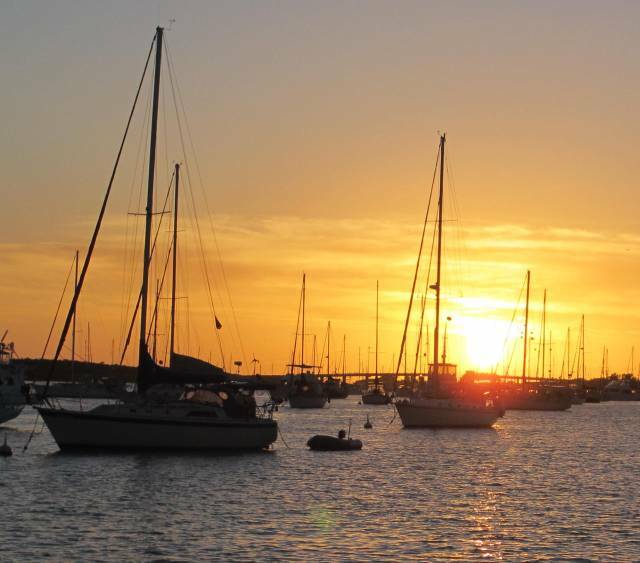 The reason we like this route so much is the sailing in Biscayne Bay. It's a protected body of water, very little wave action and usually a steady east wind resulting in a broad reach. Today was such a day.We had a 20 mile, broad reach sail in 12 to 15 kt winds! The water was flat, the air was warm, the wind was steady - what a sail - you can see a sample here. We averaged 7 to 8 kts all the way for 20 miles! 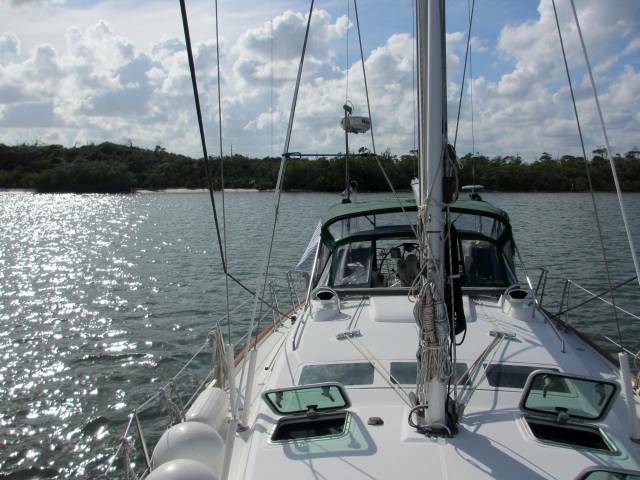 On Saturday we're off to Ft Lauderdale and we're hoping for another sailing day. The winds are predicted to be 12 to 16 kts and the waves only 2 to 3 ft, we'll see. I replaced the defective anchor switch this afternoon and adjusted the rigging to be sure everything was tight. We're hoping for another day of sailing before entering the ICW where motoring is the rule. Ann snapped this photo off the back of the boat - what colors! After 75 miles yesterday we just anchored in Caesar Creek for the night. 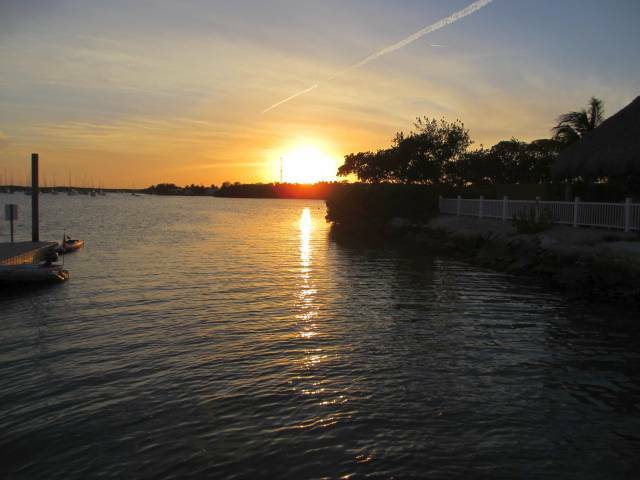 In order to make high tide for the western exit into Biscayne Bay, we would have had to leave at 6:00 am in the dark. We just were not up for that, especially after a 12 hour passage from Marathon. So with that we stayed another day and now we intend to go through the western exit at 7:15 am, at first light, just a little after high tide (since high tide advances every day). With a 1.4 ft high tide, we expect to see 5.2 ft of water on our way out. The ranger station here has a dock for getting Hoolie ashore and a grassy area for walking the dog. 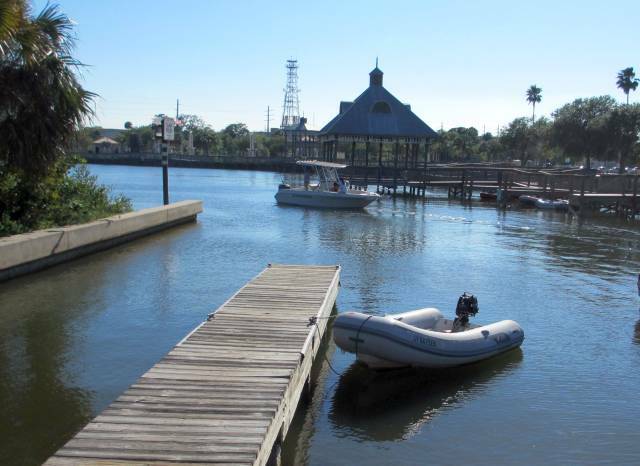 There are also docks for daytime use of small boats since the only way to get to the station is via a boat. The anchorage itself has a lot of current but it's very well protected from the north and east. If the wind was from some other direction, you could anchor elsewhere in the creek for protection. For us it's a perfect stopover. Today's activities included changing the belt on the Volvo engine (it was slipping), pouring vinegar into the intake on the Panda genset raw water pump (to dissolve accumulated salt and other deposits) and cleaning the paddlewheel of the knotmeter (done about every 3 months). You do pick up some skills, however limited, in owning a boat. 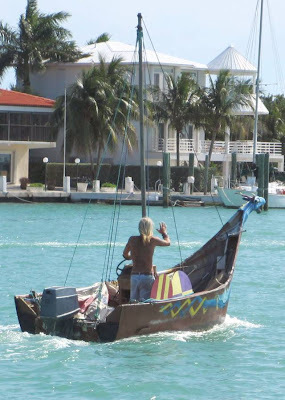 We intend to sail on Friday to Marine Stadium near Miami if the wind really is out of the predicted east direction. There's no reason to believe the weatherman will be right this time given his track record to date but one can hope. We left Marathon at first light, around 7:15 am after running Hoolie ashore. We headed out at our usual 7.3 kts but when we turned the corner to go east we immediately ran into a counter current of about a knot, knocking us down to 6.3 to 6.5 knots! The Gulf Stream is only 1 to 2 miles off the reef at the present but the counter current is in the opposite direction in Hawk Chanel. On top of that, we had a 15 to 18 kt wind exactly on the nose - so wind and waves and current were against us - what else is new? It was an 12 hour passage, long for us. We had hoped to make it through the Caesar Creek passage into Biscayne Bay but with all three elements against us, it was too much. So we decided to anchor instead in Caesar's Creek. However, that was not without excitement. The waves were rolling in, the wind was blowing and the tide was at minimum (why can't we ever come into an inlet with high tide??). Caesar's Creek is supposed to be good at all tides but as I approached the entrance, I saw the bottom drop out of the depth sounder, 6.0 ft, 5.5 ft, 5.0 ft and then I stopped looking and gunned the engine. I felt the keel slide across the bar guarding the entrance and then we were in! We only draw 4' 9" but we slid a good 30 to 50 ft before the depth returned to 10 to 15 ft. I'm not sure what we would have done if we didn't make it since the entrance to the creek is about a mile away from shore - it's a long way in. On either side of the entrance and the passage in it shoals to 2 ft or less. So now we're anchored peacefully but with a lot of current since the creek is one of the few openings between Biscayne Bay and the ocean - everything drains first one way then the other. On Thursday we plan on moving on to Marine Stadium across from Miami and await a calmer passage than the one we had today to Ft Lauderdale. We were all ready to depart this morning when the weather forecast changed at 5:00 am. Now Wednesday is supposed to be the less worse day instead of Tuesday. Giving weather forecasts for 8 days is a joke. They can't even get a 24 hour forecast with any level of accuracy. So we will continue checking NOAA marine forecasts and grib tonight and at 5:00 am Wednesday morning. At anything less than terrible, we'll start out. We have a long way to go, about 80 miles to reach our anchorage at Elliot Key, an early start and late arrival. Normally we would stop over at Rodriguez Key at the 50 mile point but that's out of the question with the winds and waves blowing directly into the anchorage - there's no protection whatsoever from the northeast to east. Once again you can follow us as we (hopefully!) proceed west by clicking on "Last 24 Hours" at the left in the blog. We celebrated our last day (hopefully!?) with a dinner at Key Fisheries and I now believe it's the best restaurant in Marathon that we've tried. The decor is very plain, typical beach shore picnic tables outside but the cooking is excellent and it's always crowded. They also have sushi prepared by a Japanese chef, the only Japanese person in the restaurant - also very good. So here we are again, waiting for weather. We are finding the weather to be very fickled. Marathon - Weather forecast change, leave on Tuesday? All day long grib and NOAA coastal forecasts did not agree. Grib showed the winds moderating on Tuesday before increasing once again on Wednesday for the rest of the week. NOAA then changed their forecast to agree with grib this afternoon. The Weather Channel forecast remains out of sync. However, we've found grib to be generally accurate and when backed up by NOAA marine forecasts, it ought to be the one to bet on. So tonight we'll be watching the weather with great attention, on pins and needles so to speak. The final say will come with the 5:00 am forecast from both grib and NOAA coastal forecasts, then we'll make our final call on whether to go. In order to make the 75 mile trip, we have to leave at least by 7:00 am which is before the sun rises here, it will be dark. By the time we clear the harbor, there ought to be light. Yeah! They had my part! 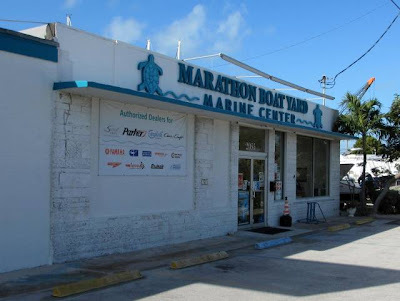 I was relieved to find out this morning that the local marine parts store (not WestMarine!) carried Volvo oil filters! I walked down and bought three just for good measure and now Fleetwing is ready to go. I'll get up around 5:30 am or so just to get everything ready and get the latest weather report. I'll run Hoolie into shore in the dark, he'll have a long day until his next relief. You can always follow our progress (or lack of it) by clicking on "Last 24 hours" under the heading of "Follow Fleetwing on Google Maps" on the left side of the blog site. It takes a few seconds to fully load but you'll be presented with a map of he keys with an icon representing Fleetwing's position updated every 10 minutes. 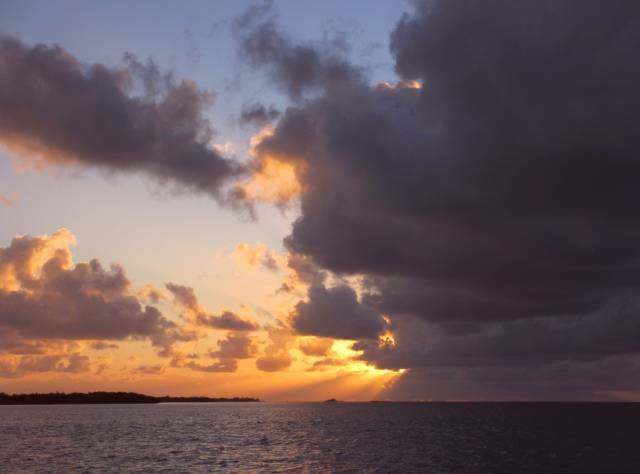 We're headed for an anchorage off the west shore of Elliot Key, hopefully before dark. So I got out all the paraphernalia I needed for an oil change on the main diesel: the vacuum oil pump, the oil filter wrench, 2.5 gals of new oil, hose connecting the pump to the oil drain pipe on the engine, a 2.8 gal empty oil container for the used oil, plenty of rags and a few other odds and ends. Notice anything missing? After emptying the engine oil and removing the old oil filter, I looked for a replacement filter out of my stock - I had none!? After a fruitless discussion with myself that will remain undisclosed, I sulked and then put most of the stuff away. Of course, all this happened on a Sunday so all the parts departments of the marinas were closed today! Groan, any time over the past 6 weeks I could have ordered plenty of oil filters but of course I never thought of it then. So a lost day. Monday I start the search for an oil filter so we can still leave on Wednesday as we had planned. Meanwhile, the genset has started cutting out again for no apparent reason (no overheat lights, no low oil pressure light). It seems to run for awhile and then decides to stop. At the moment, it's running again for who knows how long. On Monday it's another call to Panda technical support for their ideas on how to fix the problem (they also are not around on Sundays). Except for those two items, it was a great day..... We're still watching the weather, it's our greatest past time. Wednesday still looks less worse than any other day so far, stay tuned. 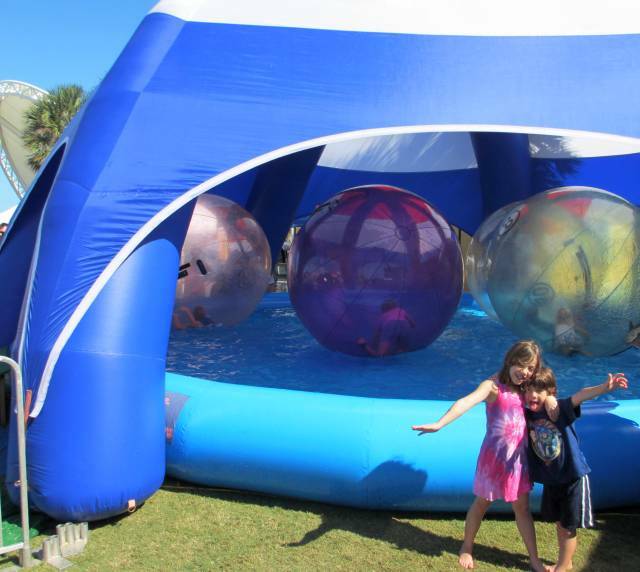 Those are kids inside those plastic balls! They roll the balls around on the water, great fun? The weather forecasts have been all over the place. Last night Saturday did not look good at all. This morning the forecast changed it looked like a good day to head north but we were short of water and fuel, not having filled up on either since arriving at Marathon. So we decided to take Saturday and get ready for any "new" forecasts in the future. We filled up our water tanks and took on fuel, now we're ready to go at a moment's notice. Of course that guarantees that the weather will be miserable for the foreseeable future! Wednesday now looks like the least worst day ahead but we are ready to move if the weather changes. Saturday was the annual seafood festival day in Marathon. It resembles a small county fair with rides, food and many booths selling all sorts of things. Ann and I were interested in trying stone crabs, they are a local delicacy. The place was packed and the lines long but I finally got two servings, 7 claws apiece (only the claws are served). They seemed similar to lobster but the claws are served cold with a light mustard sauce. Frankly, I prefer lobster but the stone crabs were a change of pace from the local seafood. Coming back to the boat I discovered a great mess! I had put the garbage in the cockpit but forgot to transfer the bag to the dinghy. As was our custom, we had tied Hoolie in the cockpit and he obviously discovered the bag and had great fun tearing it open and inspecting the contents, including the coffee grinds, grrrr. Finally we sat on the back of the boat and watched the sun go down, at least some compensation for the mess I had to clean up!